Organic Juniper Berry Essential Oil (Juniperus Communis) - Sweetgrass&Rain Inc.
A juniper berry is the female seed cone produced by the various species of junipers. It is not a true berry but a cone with unusually fleshy and merged scales, which give it a berry-like appearance. The berries are green when young, and mature to a purple-black color over about 18 months. The berries are plucked from the branches of the plant once a year, and dried and ground before distillation. They have traditionally been used as an aromatic aid to meditation, and had remedial applications. 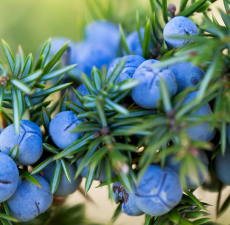 Juniper Berry Essential Oil has a fresh, rich, balsamic scent reminiscent of pine needles.